If you’re geek, you’re probably happy with speedtest.net. It gives you lost of information about ping, latency, jitter, upload, download, server location and other things important for diagnosing your internet speed. If you’re an everyday consumer however, all that information is just too much and complicated. Simplicity is where a new site by Netflix, fast.com excels. One simply has to go to the url and that’s it! The service tests the speed and gives you one figure – the download speed. Geeks among you will ofcourse complain that there’s a lot more info one needs to understand the state of their link, especially being able to set the test server, but that’s exactly why this is not for you. It’s not for diagnosis. This is definitely what I’ll recommend to friends and family. Hopefully conversations with their ISP will become much easier. Being a video streaming service, Netflix clearly has an interest in ISP customers getting good internet speed and understanding how this impacts their netflix experience. 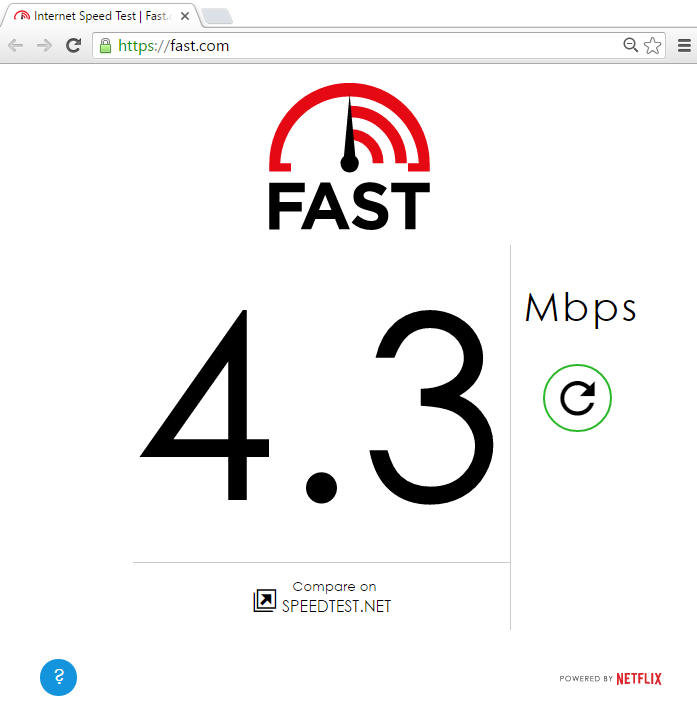 You can read an article we posted some time back on netflix content and your internet speed. Got 24 Kbps on ZOL wimax. I regret everything! Thats pathetic, i stick to my trusted uMAX for now, ZOL was sounding good because of the unlimited bit, but at that speed no thanks. Ok! My firewall was getting too much involved. Mmmm. From this I can surmise you are not in Zimbabwe. Hell you are not even in Africa. I can also deduce that you are currently living in the United States of America. Damn I am Sherlock Holmes. Damn!! You are really good. What if lm testing from inside YoAfrica NOC? I’m getting 75 kbps on TelOne ADSL Home Premier – but when I test with speedtest.net I get 3.6 Mbps – I thought I understood internet speed somewhat, but this now has me a little bit perturbed. What’s going on? I noticed that when speedtest does the ping thing, it uses a server in Zim. Is that why it gives such a number – why would it chose a local server anyway? These speedtest sites are not reliable at all. The only way to get a proper test result is to run iperf test. Test results also can not be a true reflection of your browsing experience because they sometimes are not able to capture firewalls involvement, cpu load of inline routers and switches, packet drops andcongestion. 720kbps on uncapped (2Mbps) TelOne ADSL and the logo above the figures is written “FAST”, the irony.